This article discusses the causes, cures, & steps to prevent nail pops - those unattractive mounds or sometimes open "sores" in finished interior drywall ceilings & walls. We explain why drywall nail pops occur, where they occur, and how they are repaired. 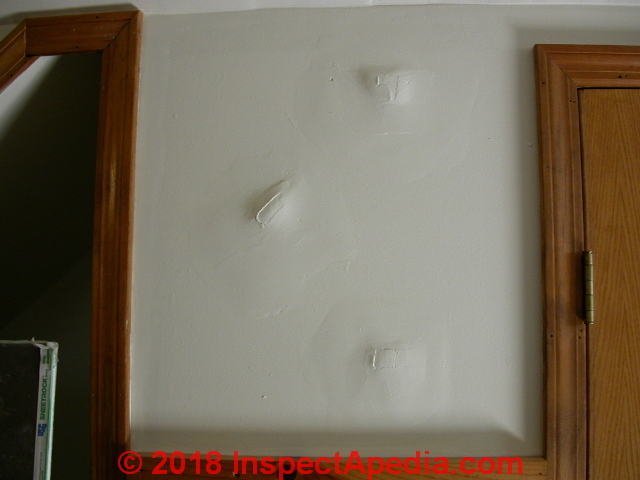 We suggest definitions of closed drywall nail pops and open drywall nail pops such as shown in our page top photo. Also discussed here: Definition of closed drywall nail pop, open drywall nail pop; impact of arched roof trusses on drywall cracks & nail popping; repair . In most cases drywall nail pops are a cosmetic defect, though in some locations such as near a center partition below a truss roof, they may indicate interesting structural movement such as arching roof trusses. We compare these drywall nail pops with thermal tracking or spots caused by ghosting. The drawing of nail pops shown below is provided courtesy of Carson Dunlop Associates and appears in their Illustrated Home. Nail pops in drywall walls or ceilings are usually a minor cosmetic issue that is common in new construction. Here we'll tell all about the types, causes, cures, and prevention of nail pops, and we'll include a little warning that while most nail-pops are just a cosmetic issue, on occasion loose or protruding drywall nails or screws could be a sign of more serious building trouble. Below we illustrate nail pops in drywall. At below left are typical closed nail pops associated with normal wood and material shrinkage - this in a home built in the 1970's. The drywall nail head extends above the surrounding drywall but the paper surface has not torn. You can see that the original drywall hanger used pairs of drywall nails at each nail location. Just below is an open drywall nail pop in drywall characteristic of material movement. You'll see that now that the bulge of pushed-up joint compound ("mud") has popped off of the wall or ceiling completely, the actual head of the drywall nail may itself not poke out of the wall. Still it needs to be re-set. If I see a lot of rust on the drywall nail I look for a building moisture problem as well. Below is a drywall nail pop that is barely discernable and does not merit special attention. You can spot even the slightest nail pop or concavity in drywall by careful use of oblique lighting. and LIGHT, FLASHLIGHT for MOLD illustrate the technique. This closed drywall nail pop shows up as a very slight raised bump that in some lighting may appear darker or lighter than surrounding area. I added a light gray circle so that you can find the spot I'm showing. THERMAL TRACKING BRIDGING GHOSTING, like the soot spots shown at above right. Drywall nail pops normally extend above the surrounding surface. As wood studs shrink, nail heads ‘pop’ out from the drywall surface, causing a bump or the blemish on the wall or ceiling. This usually happens only on new work, and only one time. 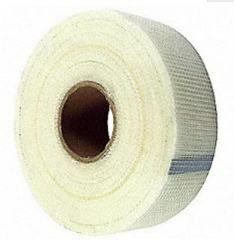 Repairs are straightforward and are given below at DRYWALL NAIL POP REPAIR OPTIONS. Nail pops found in some building ceilings and actual tears or cracks at the wall/ceiling juncture at building walls located under the center of certain roof trusses when moisture & temperature differences between the truss bottom chord and upper members cause the truss to arch. The drawings of roof truss uplift and corrective measures for truss uplift shown here are provided courtesy of Carson Dunlop Associates and appears in their Illustrated Home. Above we have described rising roof trusses and wood shrinkage as two most-common causes of drywall nail pops in buildings. Understanding the cause of any building defect, even an apparently-cosmetic one, is important both in deciding what repair will be effective and in deciding whether or not the defect, in this case nails protruding out from the wall, are actually a telltale sign of some more-serious, even dangerous building condition. Using an insufficient number of drywall screws or nails, missing the supporting stud or ceiling joist,using screws that are so short that they have inadequate penetration into the supporting stud or joist, or failing to space the drywall fasteners at the proper interval all can result in loose drywall and drywall nail or screw pops later. The maximum fastener spacing on walls when no adhesive is used is 8 inches and on ceilings, 7 inches when nails are used. The maximum drywall fastener spacing when screws are used is 16" o.c. on walls and 12" o.c. on ceilings when no adhesive is used. Using too many drywall screws can also cause drywall movement, nail pops or worse, complete separation. Screwing in a fastener ever couple of inches, for example, will so fracture the drywall that it is weakened enough to risk a failure. Over-driving screws or nails both tears the paper surface of the drywall, weakening the connection, and also fractures the gypsum below the nail or screw, leaving the fastener in a softer area of drywall. Drywall screws or nails set at an angle may also invite protruding and ugly fastener displays. See DRYWALL INSTALLATION Best Practices for additional nailing and adhesive schedules for drywall installation. Our photo illustrates impressive protruding blobs of joint compound over three popped drywall fasteners in a small section of wall. This repair was done by simply adding a mound of filler over the nail without setting the nails or screws below the wall surface. You can see that the result is not pretty. Set protruding drywall nails, add nails or better, drywall screws, and you are not likely to see nail pops again in that area. If you do then something else is going on with the structure and more investigation would be in order. 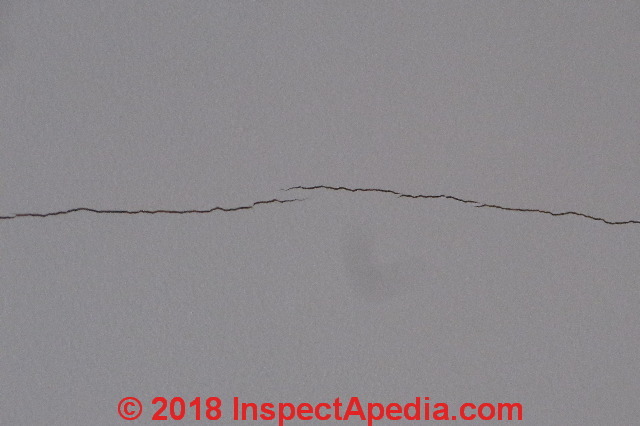 Besides arching roof trusses and thermal or humidity-induced movement, there are natural stress points in any drywall installation such as at inside corners at walls and between walls and ceilings - these are common places where you may see both cracking and nail pops. DRYWALL INSTALLATION Best Practices includes suggestions for using floating corners and control joints to avoid these issues. Movement in building walls, ceilings, and even floors (that might push or pull on walls) can cause drywall buckling, cracks, tears, and also nail pops. Small amounts of building movement associated with changes in temperature and humidity are normal and not threatening. We might find both drywall nail pops and drywall cracking in the same building area. Watch out: But if you see drywall tearing or cracking further investigation is in order. In cases of significant building movement that has separated structural connections there can be a risk of structural collapse. If you suspect foundation damage, inspect the foundation for cracking, settling, movement. Inspect the building interior for signs of framing damage, separation, movement, insect damage, leaks, rot. See FOUNDATION FAILURES by MOVEMENT TYPE. If you suspect framing damage see FRAMING DAMAGE, INSPECTION, REPAIR. The ceiling drywall crack shown above occurs in a 60-foot long ceiling of a New York home. The ceiling was built with no control joints and cracks regularly in response to variations in temperature and humidity. This same movement may also show up as drywall screw pops or buttons and tears at the drywall fasteners. More details are at DRYWALL CRACKS. The sheetrock to either side of a give nail (or pair) is often actively deflected by passers by pressing (even lightly) over long periods of time, effectively prying the nails out - as this is done damage, to the gypsum immediately surrounding the nail head occurs and so the nail is left protruding from a softened embedment site. Simply banging the nails in will not always suffice and so I advise a pair of drywall screws be placed at the above and below the original pair to stabilize the site. Thanks, we've added your observation and hope you'll find some photos to send along. I've seen similar damage in poorly-fastened drywall around doors in homes tortured by door-slamming occupants. In the last two to three years, USG has received a significant number of fastener-related drywall installation complaints in the Mid-Atlantic region (Virginia, Maryland, Pennsylvania, New Jersey and New York). Numerous drywall contractors within this region have reported raised bumps over drywall screws occurring anywhere from a few days to several months after hanging and finishing the drywall as shown in figure 1. In summary, the water-based low-VOC drywall construction adhesives failure to cure and reach a dimensionally stable condition prior to finishing is causing screw buttons. Based on these findings, it is imperative that the adhesive manufacturer’s application instructions are reviewed and followed at all times. In order to minimize or eliminate the occurrence of raised protrusions or screw buttons, USG recommends that the installer confirms that the adhesive has fully cured to ensure the adhesive has stopped shrinking and stabilized prior to the finishing of wallboard. Details are in the document we have provided above and again at the end of this article. We [DF] repair nail pops by setting (hammering) the nail about 1/16" to 1/8" below the flush surface of the drywall. The indentation is filled with joint compound, or if time is short, with Dash Patch™, and the wall is re-painted. It makes sense to wait to repair nail pops until you are planning to paint the building interior. If nail pops have been recurrent you may want to install two drywall screws about 1/2-inch on either side of the popped drywall nail to prevent further movement in this area. You'll want to hammer in the popped drywall nails (gouging them out is possible but makes a much bigger mess). A hammer with a clean face works fine, or if you're fussy, use a nail set (I don't know anyone who does that). Then screw a drywall screw about an inch away on either side of the bad-behaving drywall nail. Set the drywall screw just below the drywall surface. Ideally you'll stop before the drywall screw tears the paper surface. If you over-drive a drywall screw so that it has cut below the surface of the paper you have reduced its holding ability. Then use drywall compound or a Dash Patch or Dash Patch mix with drywall to speed up the smoothing process before re-painting. Just be sure your drywall screws are fastened into the wood or metal joist or stud, as just screwing into the drywall alone is not effective. 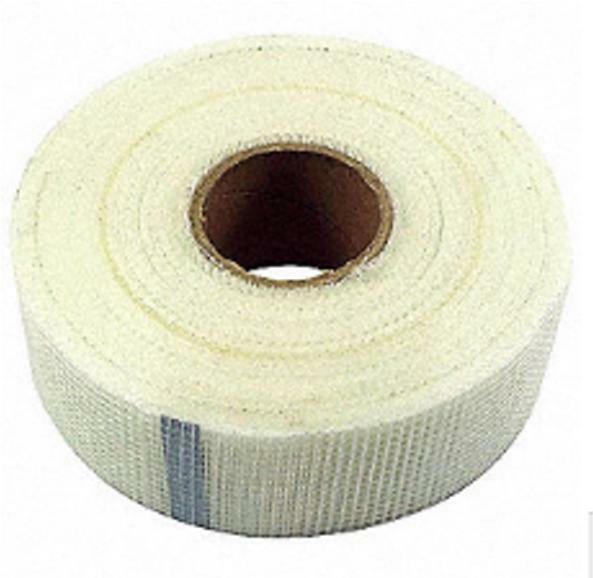 For an open type drywall nail pop in which the nail has torn the surface of the drywall paper, the smash and dash or screw and smooth repairs describe above will be still-more durable if you apply a square of fiberglass mesh drywall tape over the damaged area before applying the joint compound. Use kiln-dried lumber for framing walls and ceilings.
" With wet or poor-quality framing, there are bound to be problems in the drywall finish. With dry lumber and proper detailing, however, drywall problems can be kept to a minimum." Use drywall screws instead of drywall nails. Set the screws just below the drywall paper surface but not so deep as to cut through the paper. Floating ceiling-wall & floating corner joints: when hanging drywall on a ceiling supported by the lower chord of roof trusses, review the suggestions at TRUSS UPLIFT, ROOF, including using clips rather than screws or nails to secure drywall within a few feet of either side of building center partitions that run at right angles to the lower chord of the roof trusses. The floating corner method can be used to float the ceiling drywall over the center partitions. Details are at DRYWALL INSTALLATION Best Practices. have combined efforts to collectively adopt a set of industry-wide recommended specifications for levels of gypsum board finish. This specification identifies five levels of finishing, enabling architects to more closely identify the quality of finish required and allowing for better competitive bidding among contractors. American Society for Testing & Materials (ASTM) recognized this specification by including the levels of gypsum board finishing in ASTM C840. 1. The location of the work to be done. 2. The type and angle of surface illumination (both natural and artificial lighting). 4. The type of paint or wall covering to be used. 5. The method of application. International Building Code, Continuous Membrane, One Level.Per Section 25.210, single level drywall ceilings are exempt from lateral force bracing requirements when walls are not over 50 feet apart. When walls are over 50 feet apart, the ceiling should be examined for bracing requirements (for Armstrong drywall grid system ceiling Systems listed above). Continue reading at DRYWALL CRACKS or select a topic from closely-related articles below, or see our complete INDEX to RELATED ARTICLES below. 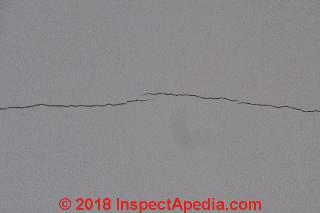 DRYWALL NAIL POPS at InspectApedia.com - online encyclopedia of building & environmental inspection, testing, diagnosis, repair, & problem prevention advice. Metal Lath Specifications, Specification for metal lath and accessories, Lath and Plaster [copy on file as/interiors/Amico_lath-inside.pdf ] - from Amico, a lath and plaster accessory producer. Paraphrasing from this document: USG uses the term shadowing in this document in describing the visual effect over gypsum board joints caused by the lower moisture absorption rate (take-up) and lower capacity than gypsum base face paper. Shadowing at joints occurs where veneer plaster is applied over tape joints, requiring a second coat to completely hide the tape, providing a visually uniform surface. USG Advises: "This [second] cover coat must be allowed to harden and dry before plaster application is started. Metal Lath Specifications, Specification for metal lath and accessories, Lath and Plaster from Amico, a lath and plaster accessory producer.